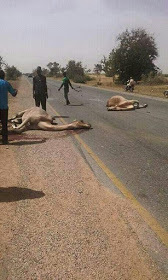 » News » Photos From The Ghastly Motor Accident Caused By Rampaging Camels In Jigawa State. 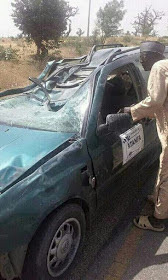 Photos From The Ghastly Motor Accident Caused By Rampaging Camels In Jigawa State. 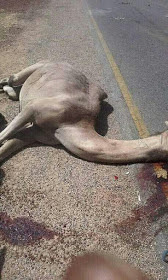 A ghastly car accident was caused by rampaging camels yesterday in Jigawa State. control their animals while on the highway following the increase in this type of accident. Title : Photos From The Ghastly Motor Accident Caused By Rampaging Camels In Jigawa State. 0 Response to "Photos From The Ghastly Motor Accident Caused By Rampaging Camels In Jigawa State."